Controversy has dogged hotel billionaire Sol Kerzner throughout his career - from Sun City in apartheid South Africa to his bid to run Britain's first supercasino. So who is he? For an introduction to Kerzner, you could do worse than dwell on the details of his 70th birthday party. It was held, of course, in Monaco, at the fashionable Sporting Club, and among the 150 or so guests present were the usual suspects, people who will fly halfway around the world for a party thrown by someone they have probably met once: Liza Minnelli, Shirley Bassey, the heirs to the Tetra Pak fortune, Wyclef Jean and - no plutocrat's birthday would be complete without her - Ivana Trump. (Her ex, Donald, once described Kerzner as "visionary".) Reports have it that, in his speech, Kerzner assumed a modest demeanour and thanked Heather, his wife, as well as his five children, six grandchildren and all of his friends. It was the sort of performance he has become known for: great bravado and extravagance on the one hand, and a sort of wry modesty on the other. Which of these two faces is the real Kerzner is a matter of some debate. He has a reputation for great charm, interspersed with outbursts of temper, but one of his most publicly recognised skills is persuading the world's superstars to attend his openings, and that includes the opening of his 71st year. Kerzner's resorts are the sort of places that the rich and famous visit either to get married (Cindy Crawford and Randy Gerber at the Ocean Club in Paradise Island; Zinzi Mandela, Nelson's daughter, and her husband at Kerzner's Le Saint Géran hotel in Mauritius), to retreat to after a bruising experience in the tabloids (Sienna Miller to Reethi Rah, his resort in the Maldives, after breaking up with Jude Law), or, as in the case of Sun City, to make enormous amounts of money. Yesterday's press coverage of Kerzner featured multiple uses of the word "vulgar", so multiple, in some newspapers, that it seemed a curtain-twitch away from familiar shorthanded anti-semitic references to gold taps and moneylending. There are, certainly, stories circulating about Kerzner's bad language, his impatience with staff and his autocratic style of management. One competitor in the gambling business told me of an incident that is said to have taken place when Atlantis, Kerzner's 2,317-room ocean-themed resort in the Bahamas, was in the planning stage. Kerzner apparently turned up two hours late for a meeting with designers, took one look at their model, and hurled it on the floor. Others who have worked with him are kinder. Adele Lucas worked with him for seven years in the 1970s, right up to the launch of Sun City. "He wasn't flashy," she says, speaking from Johannesburg. "He didn't eat foie gras; he ate hamburgers. He had tremendous energy. He didn't work just to make money, he worked because he loved the hotel business. He was always great fun but, of course, he liked things the way he liked them. I learned a great deal from Sol; I just loved him." Is he, then, a cynical profiteer, a Harry Lime-type figure who operated in the conflict-zone of apartheid without giving a damn about the consequences, or a rough diamond, an Alan Sugar figure, subject to the snobbery of the middle classes, who is, broadly, more sinned against than sinning? Kerzner's parents were Lithuanian immigrants to South Africa who settled in the seaside resort of Durban, where they had four children and made a living running a small kosher hotel on the beach front. It is said that Kerzner was bullied as a child, and enrolled in boxing classes to learn to defend himself. He toughened up further while doing national service and when he graduated from the South African army, he did an accountancy degree at the University of Witwatersrand in Johannesburg. 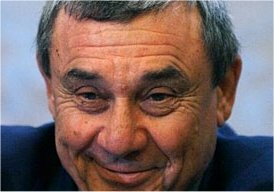 As the resistance movement against apartheid in South Africa began to take off, so did Kerzner's business career. In 1960, the year of the Sharpeville massacre, in which 67 people were killed protesting against the South African government, 25-year-old Kerzner bought the Palace hotel in Durban, a small operation he soon turned to profit. His next move was to buy the Beverly Hills hotel in Umhlanga, which became South Africa's first five-star hotel. Slowly, he expanded the franchise to 31 hotels and built a hospitality empire that would culminate, in 1979, with the opening of Sun City. Kerzner's own politics remain largely unknown, although he has tried to make a case for Sun City being a blow against apartheid - not a convincing one - and has contributed to the ANC coffers. Friends say that he is "straight down the middle" and never took much interest in the anti-apartheid struggle - at least, not until its leading lights were in government and positions of influence. But his closeness to Mandela is beyond question. As well as helping pay for Nelson's daughter's wedding, he secretly gave money to the ANC when only Mandela knew, and Mandela praised him as "by far the greatest entrepreneur in this country's tourist business". His motives continue to divide opinion. There were said to have been 15,000 visitors to Sun City on the opening weekend, largely white South Africans who drove across the "border" into the "independent homeland", or bantustan, of Bophuthatswana, where strict South African anti-gambling and indecency laws did not apply. Kerzner, in the manner for which he would become famed, persuaded major artists to appear at the resort, including Frank Sinatra, Elton John and Shirley Bassey. Technically, the boycott of South Africa remained unbroken in these cases, thanks to the quasi-independent status of the homeland. But anti-apartheid campaigners did not see it as such and labelled Kerzner as a sanction-breaker, even writing a protest song about him at one point, which appeared on the consciousness-raising album Sun City in 1985 ("I ain't gonna play Sun City/ Relocation to phony homelands" went the lyrics). Kerzner, of course, has an explanation for his actions, which were not, he says, a cynical exploitation of apartheid puritanism, but an active encouragement of harmony between the races. In 2005, in a rare interview in the Daily Telegraph, he said, "What excited me was that, in a country where the races had been kept apart by law, we'd created a place where people of all colours could eat together, gamble together, watch international shows together, even sleep together." They could also watch the Miss World contest, the 1974 winner of which Kerzner would marry. He has also had to shake off accusations of corruption surrounding his dealings with the "government" of another apartheid homeland, the Transkei, for which he was accused in the late 1980s of securing a gaming licence via bribes to the former homeland's leader, George Matanzima. Transkei's attorney general, Christo Nel, pursued Kerzner without success. Charges were dropped in 1993. One former associate of his describes to me what happened in the Transkei thus: "Sol wasn't doing anything that everyone else wasn't doing. It was the only way to do business in those parts at the time." In 1975, he opened his first overseas hotel, Le Saint Géran, in Mauritius and eventually sold off most of his South African holdings, including Sun City. He then moved his interests to the Bahamas, where he set about creating Atlantis. When it was completed in 1998, Michael Jackson sang at the opening. While his business empire expanded, so too did Kerzner's family, but his homelife has been beset by tragedy. In 1978, his second wife, Shirley, committed suicide, from which friends say he has never fully recovered. His son, Butch - whom he elected to succeed him as head of the business, and who liked to claim, with a flair reminiscent of his father's, that Atlantis rivalled Disney in the US for "brand awareness" - was killed last year in a helicopter crash over the Dominican Republic, aged 42. Butch, real name Howard, was Sol's son by his first wife, Maureen, with whom he had a further two children. He also had two children with Shirley; after her death he married Anneline Kriel, South Africa's first Miss World. For 10 years, Kerzner was engaged to Christina Estrada, a supermodel, before marrying her best friend, Heather Murphy, with whom he was pictured yesterday, his head just about level with her shoulder. His style, which has always been more Larry Ellison than Bill Gates, is starting to change. He suffered a heart attack in 1989, and had to kick his 60-cigarette-a-day smoking habit. His wife recently checked him in to the Betty Ford clinic in an effort to get him to slow down. All the while, his business interests continue to prosper. All through the 1980s his empire expanded, taking on competitors such as the Malaysian billionaire Quek Leng Chan and the giants of the American gambling industry. In the early 1990s, Kerzner's business partners thought he was mad when he suggested building Paradise Island, which he developed on $125m of Bahamian real estate, but which has grown steadily in value since then, and his own profits with it. "Instinctively," he has said, "I knew we could do it." "People will laugh at me for saying this," says Lucas, "but the thing I have admired most about Sol is his honesty. He is someone who you always know where you are with." Plenty of people will be upset by his involvement in Britain's new gambling-tolerant era, and in the change in the laws governing the industry in general. But Kerzner's ability to protect himself by appearing in the bids of both the favourite and the underdog displays a shrewdness - an understanding of the value of a safety net - that guests of Manchester's new supercasino would do well to appreciate. Men as rich as Sol Kerzner do not gamble. This document maintained by GGGwebmaster@thegoodgamblingguide.co.uk.